You just diagrammed the perfect game-winning play. Your players all seem to understand their assignments. What could go wrong? Well, most youth coaches know the answer: "Everything!" Especially with younger players, it's likely that one of your players isn't listening, doesn't understand your instructions, or will otherwise find a way to do exactly the opposite of what you want. One player may be tired and having trouble concentrating on your instructions. Another may have a short attention span. Still others are easily distracted (staring into the stands or at another game). So, as a youth coach, what can you do? If it’s a critical point in the game, raise the intensity level in your voice to pull your players into a more focused state of mind. You don't need to yell; just add the right tone. It may be the sound of resolute determination or one of confidence ("Do these 3 things, and we'll succeed."). At other times you may need to calm your players—assure them when panic or frustration is beginning to set in. Similar to how players gain advantage over an opponent by changing their speed and style of play, changing up your communication style to fit the moment will help keep your player's attention. During timeouts, don't overload your kids with multiple instructions. Focus on a few themes and key points. For instance, if your team is playing poorly on defense, identify the top 2 or 3 points you want to make (e.g., poor transition from offense to defense, no communication). Also provide specific corrective actions for individual players ("Abby, I need you to rotate back when Heather penetrates with the ball.") And when you do diagram a crucial play and assign each player their role, have the key players repeat back to you what they are to do. But as a youth coach, you also need to accept some of those unexpected game moments. You will undoubtedly encounter unscripted, if not bizarre, player behavior. 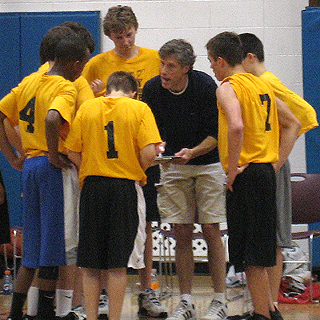 Years ago, I was coaching a fifth grade basketball game and called a timeout with about eight seconds left in the game. I pulled my team together, and diagrammed the play I wanted my players to execute. The play’s design was for one of my more athletic players, Johnny, to throw the ball in from the sideline to a player coming off a screen at half court. Picking Johnny to put the ball in play was probably my big mistake; for as good as he was athletically, he occasionally had “space cadet” moments. The referee blew his whistle to resume play; Johnny briefly looked at the court and his teammates, and then proceeded to throw the ball toward the hoop and over the backboard. The game ended and I asked Johnny what he was thinking about and why he totally disregarded my play and threw the ball at the hoop. He had absolutely no clue. Remember that kids think like kids, not like adults. Keep your instruction as simple as possible. And when the inexplicable happens, despite your best intentions, embrace these bizarre moments for the good stories they make later in life!